Just back home from dinner at a diner nearby. Burger, poutine, and cherry pie with ice cream. I am very full. It's too darn hot, too darn hot here so going out to a place with air conditioning was a good idea but I ate too much. A hot day called for a sleeveless dress. I take medication that tends to make me sweat so avoiding the dreaded "pit stain" is important to me. Seems like I'm going to need to get a few more sleeveless dresses if it's already 30C at the end of May. 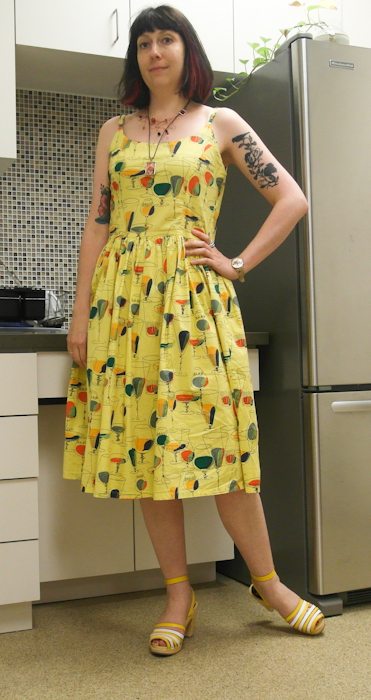 This dress has cocktail glasses on it and I got it from Modcloth a year or more ago. It's a nice bright yellow, as are these shoes. I had a secret under the dress. This very relevant slip. 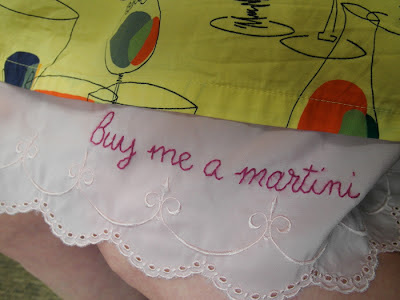 Buy me a martini, indeed! Alas, I stuck with beer tonight. Hope everyone is keeping cool. That is such a cute summer dress - I am a "heavy sweat-er" too, and am always looking for dresses that won't show dark circles under the arms at the end of the day. The slip would definitely come in handy if you were sitting next to a cute guy in a bar! That slip is darling! Where did you get it? LOVE that dress, especially the slip part! It's been really hot here too. Your dinner sounds amazing! Especially since I am on a soft foods diet for awhile, I'm already sick of jello. That dress is so cool, and the slip too! You've got the best dresses. It must be hard to decide which one to wear sometimes. I had to google poutine, and then found out that there's a brew pub here in town (Eugene, Oregon) that serves poutine. I'll have to try it sometime. The other day I wanted some British chips with curry sauce - I only had it once the whole time I lived in England, but it was good! Hee hee, I hadto google poutine too. You are teaching me things, M.
The other thing I learned from your blog today is how very nice you look in yellow. What a great detail on the slip! Ooh, that dress is adorable! Have I seen you wear yellow before? I'm sure you cover all colours in your wardrobe, but I am really taken by how great you look in bright yellow, Megan, especially with added cocktail glasses and a cheeky request for a martini on your petticoat! Fabulous sandals too, of course. You continue to have a stunning wardrobe. I love the dress and especially the shoes. Wow! wouu, love your dress, such a pretty print and also pretty shape!, and love that it matches your shoes! !, and that delightful petticoat is really appropriate, martinis for everyone!! really I'm keeping cool, I'm still wearing a coat! What an adorable slip! I love slips, as I think they can be a sly little secret -- as you have proven. what a lovely dress, I love the secret message! I'm with Franca! 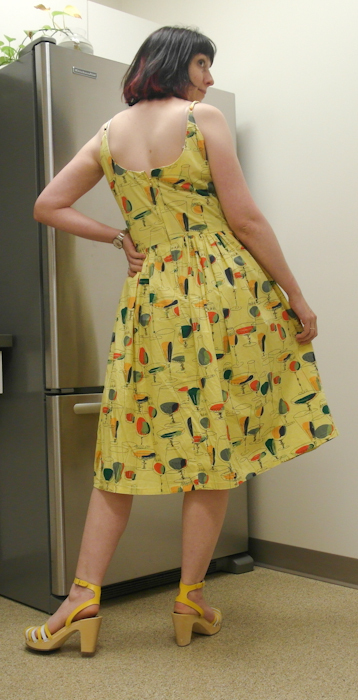 Fabulous retro-pattered dress. And a secret message? Too cool! Here's to finding more fun, sleeveless summer dresses!